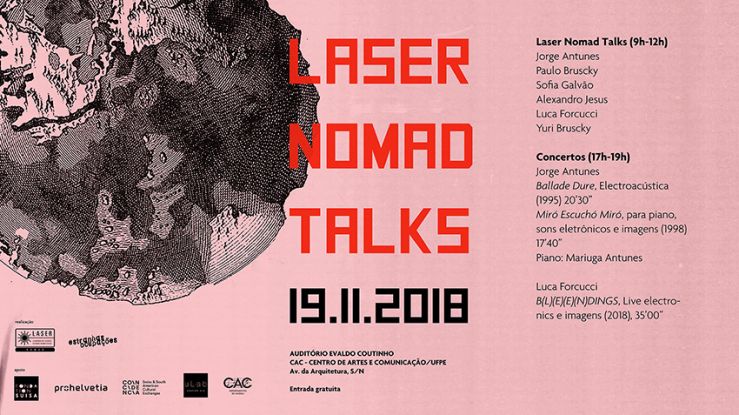 «LASER NOMAD» is a series of meetings, interviews, musical presentations, workshops and seminars developed by the Swiss musician and artist Luca Forcucci in partnership with interdisciplinary art and science study institution Leonardo LASER/ISATS and with local interlocutors such as Valério Fiel da Costa (composer and lecturer at UFPB), Jorge Antunes (composer), Paulo Bruscky (artist), Yuri Bruscky (sound artist), Sofia Galvão (computer scientist), Alexandre de Jesus (anthropologist and museologist), Barbara Carine (chemist and lecturer at UFBA), Paola Barreto (artist and lecturer at UFBA), Ines Linke and Ciane Fernandes (artists and lecturers at UFBA). Forcucci developed the project following a long journey through the Northeast of Brazil in 2017. It is the result of research carried out by the artist in the country for over a decade and explores ancestral technologies and relationships between the construction of handmade instruments and the contemporary electroacoustics of sound art. Luca Forcucci’s research examines the properties of sound, space and memory. He explores their experimental possibilities through his work as a composer and audio-visual artist. In this context, he is interested in perception, subjectivity and consciousness. Since 2008, he has been collaborating with scientists in the field of neuroscience, as well as biologists.